My Generation – The Who Story is the ultimate celebration of one of the most iconic bands of our time. 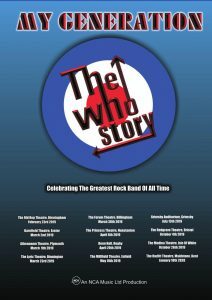 The show features full 7-piece band The Who’s recreating the biggest moments and playing the biggest hits from the bands storied career. Taking you on a journey that begins with the kings of Mod, with the music that inspired youth culture through their major mile stones, the iconic concept albums Tommy and Quadrophenia and right through the years that saw them transform from leaders of a movement to creative geniuses that changed the face of music. Expect an explosive, interactive concert format show with video projection and a spectacular light show whilst you immerse yourself in this huge celebration of the greatest band of our time. My Generation – The Who Story is a must-see production.